Made from native New Zealand "rimu" wood. Beautifully styled upright design. The "delta" style orifice is standard - no threading hook required. There are many accessories designed for this wheel, including a high-speed head which gives ratio's up to 32:1 for spinning very fine yarns, also a slow-speed kit for bulky yarns. 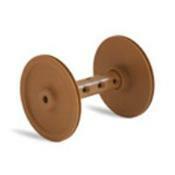 Wood bobbins, a "cotton" or standard orifice flyer, a "trundler"(wheels) are also available. The wheel is fully finished - minor assembly required. 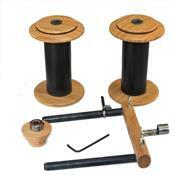 4 bobbins are supplied as standard. 10 ratios from 4.00:1 to 15:1. Weight is approximately 15 lb.